Vocational trainers on ‘vacation’ ? A majority of 23,000 students who have undergone training in various trades face an uncertain future even though the government has belatedly initiated an exercise to streamline and overhaul the programme started by the State Council for Vocational Training (SCVT). In all 257 private institutions of vocational training were set up under the programme and as per available indications a large number of them may have to be closed down. With lack of marketing facilities being the main hurdle in expansion of floriculture, medicinal herbs and organic products sector in Himachal, the state government is considering setting up its own infrastructure at Kundli for which land will be sought from the Haryana Government. While the Himachal Pradesh Congress Committee (HPCC) is still having rounds of feedback from different quarters about the potential party candidates, there are reports the party may bank on Narinder Thakur, who recently joined the party after quitting the BJP, for the Hamirpur constituency. “I am nobody to decide candidates for the forthcoming parliamentary elections from the state,” said HPCC president Kaul Singh when asked to comment about his reported statements that all sitting MPs from the state would be fielded again. Former excise and taxation minister Rangila Ram Rao claimed that the BJP government headed by Chief Minister P.K. Dhumal had double-standards as the government on one hand is accusing the UPA government of not giving any help and on the other is claiming credit for getting Central schemes like World Bank-sponsored express highway projects, ESIC medical college, IIT and Asian Development Bank loan for the state. Air India has finally announced the withdrawal of its flights on the Delhi-Kullu-Delhi circuit from November 22. Monisha Nanda, secretary (tourism), could not be contacted since yesterday for her comments on the issue. The Power Engineers Association has demanded immediate withdrawal of the latest notification assigning work to the newly set up Himachal Pradesh Power Transmission Corporation Limited (HPPCL), terming it as a precursor to the unbundling of the state electricity board. The state committee of the Himachal Kisan Sabha (HKS) has criticised the government for failing to provide quality chemical fertilisers to farmers. The crops can be severely affected in case there is further delay in providing fertilises to the farmers. PWD minister Thakur Gulab Singh has said he will not tolerate corruption in the department at any level and anybody found involved in any such case will face strict punishment. He said this while addressing a news conference here today. The Director of the Central Potato Research Institute has been awarded the fellowship of the prestigious National Academy of Sciences , Allahabad, for his outstanding contribution to potato research in the country. He is the first potato scientist to get this honour. The PTA Teachers Union has decided to seek the help of various student, youth and social organisations to intensify its agitation in protest against removal of some PTA teachers from job. 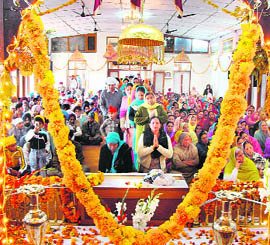 Una MLA Satpal “Satti” has praised the working of Prem Ashram, home for special children run by Sisters of Jesus and Mary here, while presiding over the annual function of the school. With the departure of palanquin of Lord Parshuram and other deities after the holy dip in the Renuka Ji Lake on the occasion of Kartik Purnima, the six-day long state-level Renuka fair concluded here this evening. Peeved at the lack of police action in a case involving disappearance of a girl along with three local youth, an irate mob today gheraoed the Baddi police station from 12:30 pm to 2 pm. Former Deputy Speaker Dharam Pal Thakur (58) passed away this morning at the IGMC, Shimla, where he was admitted on Tuesday following a cardiac arrest. The two-day national conference organised by the Mechanical Engineering Department of the NIT, Hamirpur, was inaugurated today by Major-General P.N. Kaul, additional director general of the Survey of India, Chandigarh. Kaul talked about latest advances in the digital technology of mapping for conducting survey. The hapless pass-outs and the owners of these institutions will have to pay the price for the folly of the government which allowed introduction of unrecognised courses in utter disregard of norms, standards, duration and even eligibility for admission and employment. As a result a majority of those who have undergone training in these institutions are not eligible for employment even within the state. For instance, courses were introduced for physical training instructor (PTI), library science, art and craft teachers without the mandatory approval of the national council for teachers education (NCTE). Having undergone vocational training in unrecognised institutions the pass- outs are not eligible for jobs. In case of ayurvedic pharmacist students from the humanities stream were admitted whereas as per norms only science students are eligible for the training. Similarly, for the pump operator course the duration of training was kept only six months even though the minimum duration of such course for employment in the irrigation and public health department was one year. Almost 75 per cent of the students have undergone training in these trades but they were not eligible for jobs. On the other hand there were hardly any students in courses like tourism and travel guide, marketing and advertising, mass communication and other trades for which there was vast scope of employment in the private sector. The government has now decided not to admit any new batch of trainees until the exercise to streamline the SCVT courses was completed. A committee has been set up under the chairpersonship of the Chief Secretary to suggest corrective measures. The minimum standards are being revised and all the institutions will be inspected afresh to ascertain if they fulfil the prescribed standards in respect of physical infrastructure and staff. The government has no option but to allow only courses recognised by the natinal regulatory bodies like the NCTE so that the pass-outs were eligible for jobs all over the country. Despite best efforts of the government, farmers in the state have not taken to floriculture and organic farming in a big way despite the agro-climatic conditions being suited for cultivation of many exotic flowers. The state government owns some land in Kundli, but since it would not be insufficient for having a big set up the Haryana Government will be requested to provide land for the purpose. “Since having proper infrastructure for selling flowers, medicinal herbs, off season vegetables and organic products is a pre-requisite, we have now decided to have proper marketing set-up along with other facilities at Kundli in Haryana,” confirmed horticulture minister, Narender Bragta. He said though Delhi Chief Minister Sheila Dikshit had been approached by the horticulture and agriculture ministers of Himachal, Uttarakhand and Jammu and Kashmir to provide them some space in Delhi, with the response being negative now a similar set up would be established at Kundli. He added that the sates of Jammu and Kashmir and Uttarakhand would also be roped in so that a huge market on the lines of Azadpur Mandi can be set up at Kundli. Even though flowers like lilium, tulips, carnations, which are in great demand in Delhi and other big cities are being grown in various parts of Himachal, in the absence of proper marketing channels, the farmers are apprehensive to take to floriculture. The situation in case of organic products is just the same. The proposal to have its own marketing set up at Kundli will prove to be very helpful for the growers as despite having quality produce they are unable to get good returns due to problem in marketing. As such government efforts to encourage farmers to go in for crop diversification and high returns have not yielded results. However, some big growers have taken to floriculture and cultivation of organic products, but the farmers having smallholding have not ventured into this field for the lack of marketing network. The government also proposes to use its set up at Kundli for sale of other fruits like strawberry, kiwi and cherries, which are gaining popularity in the hill state. Narinder Thakur, former Hamirpur district president of the BJP and son of BJP stalwart late Jagdev Chand Thakur, has not only become quite active during the past few weeks, but has also undertaken the tour of few assembly segments in Hamirpur and Bilaspur district and is scheduled to visit Una soon. Though district leaders of the party are by and large maintaining silence on his entry into the party, the leadership is reportedly trying to bring unanimity in the party to put a stiff challenge to sitting MP Anurag Thakur, who has already been nominated by the BJP. According to sources, while the Congress leadership will try to utilise him to create bickering within the BJP, they also want to keep Chief Minister Prem Kumar Dhumal on the defensive by exploiting the name and mass base of late Thakur Jagdev Chand. Though Congress leaders are trying to put a brave face after their humiliating defeat of their candidate at the hands of BJP candidate and son of Dhumal, Anurag Thakur, with a record margin of 1,74,666 votes in the last byelection, they are finding it hard to find a strong candidate to meet the challenge of the BJP in its citadel and home constituency of the Chief Minister. There are reports that even the field surveys got conducted by the Congress high command have received good feedback about the potential of Narinder Thakur. Kaul Singh, who was on a trip to the Jawalamukhi area today, seemed to be on the defensive after former Chief Minister Virbhadra Singh criticised him for transgressing the domain of the party high command in announcing party candidate. Kaul Singh said the decision regarding fielding the candidate would be taken by the party high command and no decision had been taken as yet to field all three sitting party MPs from the state. He denied that Narinder Thakur, BJP rebel who recently joined the Congress, had been promised the party ticket. The decision regarding giving him the party ticket from the Hamirpur constituency would also be taken by the party high command, he said. He denied that he had ever given a statement regarding ticket allotment to sitting party MPs. Talking to mediapersons here today Rao said it was shameless on part of the BJP that it was claiming credits for Central schemes sanctioned by the Congress-led UPA government. On the other hand the Dhumal government was denying that it was not getting any Central government help, he added. Rao cited from the Dhumal government information that the state is getting 62 per cent as central aid, 25 per cent as loan from various sources and 13 per cent is generated from its own resources in the state. He said it was during the previous Congress regime that IIT Mandi, central university and NREGA in all districts were launched in which the BJP had no contribution. He accused PWD minister Gulab Singh Thakur of re-inaugurating and changing alignment of the World Bank-sponsored Rs 1,365 crore express highway road projects- Sarkghat-Ghumarwin, Una-Ner Chowk-Karkhal, which were initiated during the time of the Congress regime in 2004. The World Bank projects also included 2,000 km of road tarring, he added. Rao claimed that demand for Mandi college in government sector was a Cabinet decision and the Congress party would fulfil its commitment when it comes to power. Rao claimed that not even a single new central scheme had been brought to the state by the BJP government. These schemes have long gestation period and the BJP is far taking undue credit for old schemes initiated by the previous Congress government, he added. The pleas of hoteliers and travel agents on the issue were not paid heed by the government and the Chief Minister. General secretary of the association Subhash Malhan said Air India should have increased its frequency as promised by the civil aviation minister and the Chief Minister. He alleged the state government was indifferent toward tourism promotion in the area. He said the withdrawal of flights would hit the tourism and handicraft industry in the region.Atul Sharma, director of a five-star hotel here, criticised the move of withdrawing Air India flights, thus providing an opportunity to private careers to charge exorbitant price on this sector. The president the Travel Agents Association said the Air India move would not only hit tourism in the state but also affect the price line of air tickets. A delegation of the association led by general secretary Suneel Grover met Chief Minister P.K. Dhumal and drew his attention to the notification dated October 31, 2008, as per which all new and ongoing works pertaining to construction, strengthening and upgrading of transmission lines of 66 kv and above had been assigned to the new corporation. It would also handle matters related to planning and coordination with the central transmission utility, the central electricity authority and the union ministry of power. Consequently, the board would not be left with any work pertaining to transmission, making obvious that the government had plans to trifurcate it. When the corporation was created in September, it was given to understand that its purpose was to plan and erect transmission network for the evacuation of power to be generated by the state power corporation and independent power producers (IPPs). This was done to instil confidence among the IPPs with regard to availability of matching transmission system for evacuation of power to be generated at their projects. The board had already prepared a master transmission plan for the projects coming up in five river basins in the state and a special purpose vehicle (HPPCL) was created for its implementation. However, the recent notification had belied that understanding and given indications that the government had other plans (trifurcation of the board) in mind. Grover urged the Chief Minister not only to withdraw the notification but also issue a fresh notification in respect of work to be undertaken by the HPPCL, clearly stating that “only the execution of master transmission plan would be carried out by it” and no other work. It must be ensured that the board was not divested of any of its mandated activities and existing or new transmission works of 66 kv and above. State president of the sabha Tikender Singh Panwar said it was sowing time for Rabi crops along with peas and garlic and there would be delay in sowing in case fertilisers were not provided. He said the farmers all over the state were facing acute shortage of carbon ammonium nitrate (CAN), urea, di-ammonium phosphate (DAP), nitrogen, phosphorous and potassium fertilisers like IFFCO, SUFLA and potash. The sabha would hold a massive campaign from November 24 to 30, highlighting the problems being faced by the farming community. On December 1, protests and demonstration rallies would be held at the block level throughout the state, he added. “Due to shortage of these fertilisers in government godowns, the farmers have been forced to buy spurious fertilisers from private manufacturers, thereby enhancing the cost of production,” he said. He said even the government was purchasing spurious fertilisers without certification in the name of organic fertilisers. “Organic fertiliser is nothing more than soil and the samples of DAP have recently failed laboratory tests,” he said. He lashed out at the BJP regime for failing to provide fertilisers to the farmers despite the fact that in its election manifesto the party had promised to provide fertilisers at cheaper rates besides ensuring their timely supply. Dharamsala: Farmers have started feeling the pinch of acute shortage of fertilisers in the state. There are not getting NPK fertilisers and it can adversely affect the yield of rabbi crops and vegetables in the state. Fertilisers are supplied to farmers through cooperative societies of farmers that get supplies from HIMFED and IFFCO. According to farmers, they had deposited money for NPK fertilisers with the respective cooperative societies on September 15. “Ideally, we should have got the supplies within 15 days. However, the wait has already stretched over 45 days,” they said. Officials of a cooperative society said they were not getting supplies from IFFCO and HIMFED. Fertiliser development corporation officer of HIMFED Rikhi Ram said they had not received fertiliser supply from the Union Government that was scheduled for November. “The Centre has imposed a cut on supply of nitrogenous fertilisers and we are being forced to pass on that cut to farmers. In October, the state got just 5,200 tonne fertilisers against the demand of 7,200 tone. IFFCO and RCF are main suppliers of NPK fertilisers to the state,” he said. IFFCO marketing head in the state V.K. Sharma did not pick up his phone despite repeated calls. Agriculture extension officer of Palampur Agriculture University K.K. Katoch said the shortage of fertilisers was going to impact the yield of rabi crops and vegetables. The damage might have already been done as the NPK fertilisers were actually required in a month of sowing. He said the department would lay stress on quality control. The government had already created a new post of engineer in chief quality control so that there were regular inspection of roads and building projects. He also ordered a probe into the construction of the “Kangoo tha Proh to Salera” road in Chadiar subdivision. He has more than 37 years of experience in research and development of potato, especially potato breeding for disease resistance, processing and true potato seeds. He has been associated with development of 16 high yielding varieties and two more, Kufri khyati and Kufri Girdhari, are awaiting release. He did pioneering research in the development of processing varieties and technology for production which revolutionised potato processing in the country. The techniques of post-harvest handling and production of potatoes for chips and French fries in India are among his notable contribution. Even as the chain hunger strike of PTA teachers here in the state capital entered the 37th day today, the PTA teachers have decided to hold protests and demonstrations. “We have already held talks with representatives of various organisations who will join our stir and give arrests to protest against government decision,” said Vivek Mehta, state president of the union. He said the government was acting out of political vendetta and hundreds of PTA teachers had been thrown out. “The appointment of teachers batch-wise in place was totally illegal as even the Supreme Court has said that an ad hoc appointment cannot replace an ad hoc appointee posted earlier,” said Mehta. He said the institute should give him the list of instrument, which are required for the betterment and promised that he would take up the matter with the state government so as to provide them with the required assistance. He appreciated the cultural programme presented by the special children at the function. Sister Nirmal, in charge of the special school, said the institute had 100 special children and two students Rakesh Sharma and Nivar Prabhakar have been selected to participate in the World Winter Games in the USA. Governor Prabha Rau participated in the departure ceremony of deities and paid obeisance to Lord Parshuram and Bhagwati Renuka Ji. Presiding over the closing ceremony of the fair the Governor said fair and festivals were symbols of our rich cultural heritage, which needed to be preserved at all cost. The Governor said preservation of culture was very important for development of society and added that young generation should be aware of these traditions. Raising slogans against the inability of the police to trace the girl despite registration of a case on November 2 residents led by the former Congress MLA from Doon Lajja Ram raised slogans and demanded transfer of the lax police staff. The agitating mob also threatened to gherao the Nalagarh police station tomorrow and launch a chakka jam later if the girl was not traced at the earliest. This created an unsavoury situation for the policemen who have been putting their efforts to trace the missing girl. SHO Madan Kant said a case under Sections 363, 366 and 120-B of the IPC for abduction and conspiracy had been registered against three youth Rishab, Intiaaz and Naresh on the complaint of the villagers. The mobile phones of the youth had been put on surveillance and efforts were afoot to trace them. He said they were trying to trace the girl. Thakur, who represented Arki constituency from 1993 to 2007 for three consecutive terms in the Vidhan Sabha, is survived by his wife, son and a daughter. He was cremated in the afternoon at Chakhar village, which was attended by politicians from the Congress and the BJP. Those present included MP D.R. Shandil, Arki MLA Govind Sharma, former MLAs Ram Lal Thakur, Sohan Singh and Tilak Raj Sharma, PCC secretary Sanjay Awasthi among others. Former Chief Minister Virbhadra Singh expressed shock at the sudden demise of Thakur. In his condolence message Virbhadra said he had lost a friend and an able leader. He described the departed leader as one who espoused the cause of the poor and the downtrodden. His efforts for rural development of his constituency as well as entire district would be remembered for long. Prof S.K. Saha from IIT Delhi, who was the guest of honour, in his interaction asked the students to get more acquainted with the robotic technology. Nearly 45 delegates from various institutions in India and abroad are participating in the conference and about 106 papers would be presented, which have been considered for publication in the proceedings.